This radio image of the central region of the Milky Way Galaxy holds a new radio source, GCRT J1745-3009. 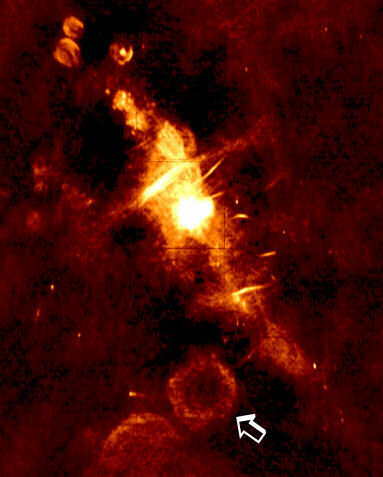 The arrow points to an expanding ring of debris expelled by a supernova. Hyman, four Sweet Briar students, and his NRL collaborators, Drs. Namir Kassim and Joseph Lazio, happened upon transient emission from two radio sources while studying the Galactic center in 1998. 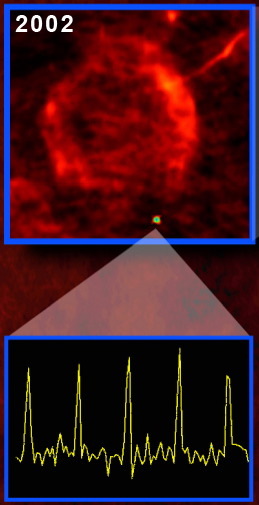 This prompted the team to propose an ongoing monitoring program using the National Science Foundation’s Very Large Array (VLA) radio telescope in New Mexico. The National Radio Astronomy Observatory, which operates the VLA, approved the program. The data collected, laid the groundwork for the detection of the new radio source. The new radio source is located below the expanding ring of debris of this supernova remnant. The plot illustrates the radio light curve of the five detected bursts occurring every 77 minutes. “Needless to say, the discovery of these transients has been very exciting for our students,” Hyman added. Participating in this research program has inspired at least two of Hyman?s students  Jennifer Neureuther and Mariana Lazarova  to pursue graduate studies in astronomy. NRL is also contributing to an effort to build the world’s largest and most sensitive low-frequency telescope, called the Long Wavelength Array (LWA), which may revolutionize future searches for other radio transient sources. Current plans call for the LWA, which is being developed by the University of New Mexico-led Southwest Consortium, to be sited in New Mexico, not far from the VLA. Sweet Briar College is consistently ranked among the nation’s top liberal arts colleges.ÿ Founded in 1901 as an independent undergraduate college for women, Sweet Briar continues its commitment to the education of women, offering a full range of liberal arts majors, including subjects traditionally considered male domains. Its customized educational programs combine the liberal arts with preparation for professional life, equipping students to successfully enter graduate school and/or the workforce. Sweet Briar’s excellent academic reputation, spectacular campus and attention to the individual attract smart, confident women both nationally and internationally. The College is located on more than 3,000 acres in the Blue Ridge Mountains just north of Lynchburg, Va. For more information visit www.sbc.edu. NRL is the Department of the Navy’s corporate laboratory and conducts a broad program of scientific research, technology and advanced development. The Laboratory, with a total complement of nearly 2,500 personnel, is located in southwest Washington, DC, with other major sites at the Stennis Space Center, MS; and Monterey, CA. For more information about NRL, visit www.nrl.navy.mil. The National Radio Astronomy Observatory (NRAO) is a facility of the National Science Foundation, operated under cooperative agreement by Associated Universities, Inc. NRAO designs, builds and operates the world’s most sophisticated and advanced radio telescopes. Facilities include the Very Large Array, the 100-meter Robert C. Byrd Green Bank Telescope, the Very Long Baseline Array, and the Atacama Large Millimeter Array. For more information about NRAO, visit www.nrao.edu.